eBuddy is a mobile messaging app and a web messaging service. 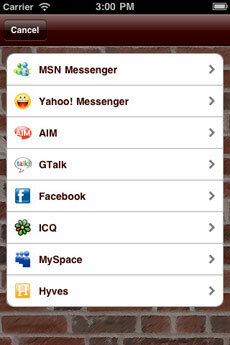 With eBuddy you can message to MSN, Yahoo, Gtalk, Facebook, ICQ, MySpace and AIM (AOL). There is a specific eBuddy mobile app made for the iPhone and for Android (the Blackberry app is coming soon); however, the eBuddy Mobile Messenger is compatible with many mobile phone brands (check the eBuddy website to see if your particular model is compatible). As well as sending free chat messengers between eBuddy users and your social networking friends, you can send photos directly from you phone camera, give yourself an avatar, and even send chat messengers to users who are offline - they will get your message as soon as they sign in again. eBuddy Lite Messenger is compatible with any mobile device and is usable as long as there is an internet connection – which means it works on the iPod Touch and the Sony PSP, etc. The Lite version uses the device's mobile browser to send chats. 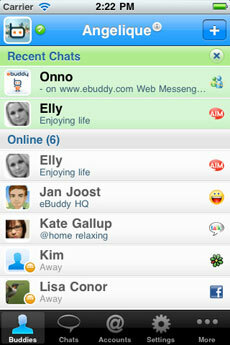 From the eBuddy website you can log-in to any of your social networking sites, and chat directly from your browser. Create an eBuddy ID to make signing in faster and to have one log in to all your instant messaging accounts. The mobile app costs $4.99 from iTunes for the iPhone; free for Android.